Want To Transcribe More Than 30 Seconds? Transcribe any youtube video, audio file (mp3/wav) or microphone recording. Currently only 30 sec clips can be transcribed, as it is a heavy operation. You ll get an editor to visualize note strengths with time and finally you can convert to guitar/piano tabs. Its a process of conversion of music audio into music notes so that it can be played on an instrument. Experienced musicians can do so by listening to the song again and again and using their ears to match and write down notes. Amateur musicians might find it hard and require tablature/sheet music written by others to learn a song. Nevertheless, its a time consuming process for even an experienced musician and this tool is all about making this process simpler, faster and automatic by using technology. We are like music transcription services online, with an added technology to make it faster to transcribe music online on our editor. What kind of music piece can I transcribe using Acousterr's automatic transcription technology? Any clean pop song with vocals, piano and clean acoustic guitar should be transcribed successfully. Distortion isnt currently supported. Nevertheless you can try ANY song and utilize spectrogram editor and tempo control to hear out a song slowly and adjust notes accordingly. Whats the output of transcription? 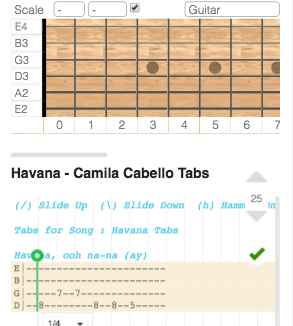 The final outcome of transcription is tablature - you can either export the notes into Guitar or Piano tablature and you can easily edit them using our awesome Tab Maker application. 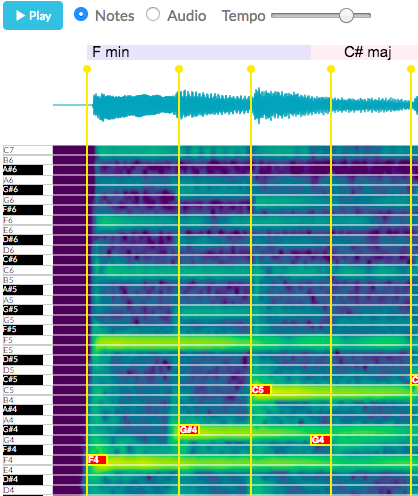 Also you ll be shown an intermediate screen where a spectrogram containing a heatmap of note strengths with time will be shown, in which you can visualize notes, hear them and edit accordingly. How this technology works and what improvements are planned? Music transcription is an extremely challenging problem to tackle using machines. Even till date PhDs are being done in this subject. In the words of a Stanford researcher, polyphonic music transcription is a 'devilishly difficult problem'. We have developed this proprietary technology using state of the art deep learning paradigms and is currently in Beta stage, where we are collecting dataset and improving our models. We are continuosly working to make this better and enhance the user experience for a smooth, faster and accurate transcription.